McLeod Ganj is a popular tourist destination and has been since ages owing to its natural beauty and mind-blowing surroundings. Placed at a high altitude in the state of Himachal Pradesh, this city is named after David McLeod. It is the residing place for the famous Buddhist figure, the Dalai Lama. The city has high Tibetan influences and there is a renowned learning centre of Tibetan culture and Buddhist teachings. The town features several awe-inspiring prominent historical temples, monasteries and ancient structures. The mystic beauty of the quaint suburb of Dharamshala is a paradise for nature and peace lovers. The surrounding Dhauladhar Range is instrumental in the unparalleled beauty of McLeod Ganj. For people residing in Delhi, this place offers the perfect break to unwind and refresh your senses. McLeod Ganj experiences three seasons namely summer, monsoon and winter. The climate during the summer and post-monsoon season makes it the best time to visit McLeod Ganj. Summer (Mar - June): Maximum temperature is 38°C and lowest is 22°C. The weather is pleasant and a perfect time to indulge in some sightseeing and adventurous activities like trekking and paragliding. Monsoon season (Jul - Aug): Welcomed by heavy rains, the monsoon season is not the ideal time to visit McLeod Ganj, as landslides are a standard feature. September becomes pleasant and beautiful with a lush green atmosphere around. Winter season (Dec - Feb): This period witnesses the coldest months when the temperatures hover around the freezing point. Snow-capped mountains offer the best scenic views for a romantic stay in McLeod Ganj. The journey from Delhi to McLeod Ganj takes about 10 hours covering a distance of close to 500 km. You can alternatively break your trip by dropping off at Una, Ambala, Chandigarh, and Dharamshala. By Air: Gaggal Airport is the nearest airport to McLeod Ganj, placed 10 km away from Dharamsala. You can cover the remaining distance by boarding a cab from the airport till McLeod Ganj. By Road: Several frequent buses and taxis connect to McLeod Ganj. Once you are in McLeod Ganj, you can easily walk across to reach the designated places in the region. By Rail: The nearest railway station to McLeod Ganj is around 90 km away. Any train till Jammu would drop you close to a place where you can quickly board a bus or a cab to reach McLeod Ganj. Route 1 would be the most preferred route to travel from Delhi to McLeod Ganj. The entire journey would take about 10 hours. The ride starts from the capital city, Delhi; the first stop over would be at Jalandhar, located in the state of Punjab, India. The journey can be completed in approximately 6 hours. These are some of the major pit stops on the way. This city has a rich cultural heritage, several historical monuments and a rich tradition. Explore the ancient monuments, tombs, forts and temples. Sports are an integral part of the culture and traditions in Jalandhar. Many sports goods manufacturers placed in Jalandhar export goods to various countries and other destinations in India. Dharamshala is a beautiful hill station placed amidst snow-capped mountains amidst the foothills of Dhauladhar ranges of Himachal Pradesh. Dharamshala is split into two parts by altitude; lower Dharamshala and upper Dharamshala. The lower Dharamshala features the central city that is a bustling commercial centre and upper Dharamshala is a township featuring British colonial style buildings. The forests found in Dharamshala are rich in pine and oak and are considered by many as a paradise for nature lovers. Dharamshala is also the residing place of the holiness, the Dalai Lama. This cultural town is an ancient hub of the region due to its handmade carpets, garments and handicrafts. Dal Lake, nestled by Deodar forests and scenic surroundings, is a high-altitude lake connecting the Naddi village and McLeod Ganj. The lake has religious history and sentiments attached to it. A temple dedicated to Durvasa near the lake is quite popular. 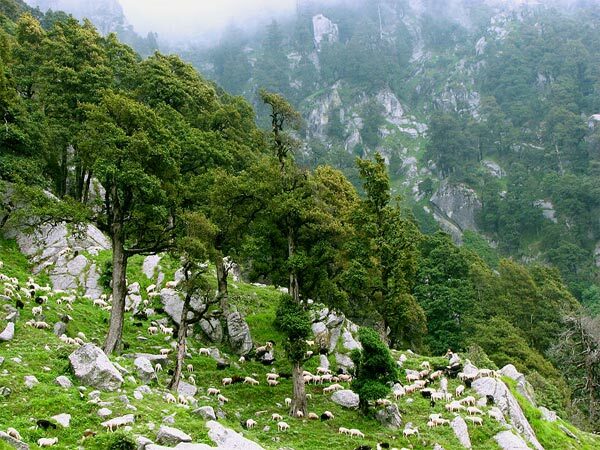 The Triund Trek, a beautiful trek of 9 km from McLeod Ganj, covers almost all popular attractions in the area like the Dhauladhar peak of the Western Himalayas, an eco-friendly destination oozing with fresh air and breathtaking views. The Bhagsu Falls is a small waterfall spot that offers a peaceful and tranquil environment blessed with a beautiful natural ambience. The Dalai Lama Temple is one of the prime attractions of McLeod Ganj. Other popular attractions feature Namgyal Monastery and Naddi Village. McLeod Ganj is nestled in-between several picturesque destinations like Srinagar, Manali, Dalhousie, Shimla, Amritsar, Alchi, Chakrata, Chamba, Jammu, Katra, Kangra, Kulu, Kyelang, Dharamsala, Palampur, Gurdaspur, etc. All these destinations experience a pleasant climate and are blessed with incredible natural beauty. Dharamshala and McLeod Ganj have plenty of options for travellers to indulge in adventurous sports like mountaineering, camping and trekking. The rich cultural biodiversity and mesmerising natural beauty attract several tourists and visitors each year.